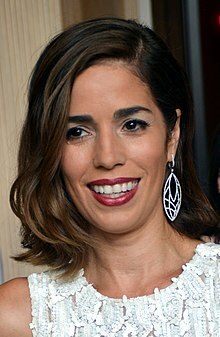 Ana Ortiz (born January 25, 1971) is an American actress and singer. Having pursued a career in ballet and singing from a young age, she eventually attended University of the Arts. Ortiz began her acting career in theatre, in early 2000s starred in the short-lived NBC sitcoms Kristin (2001) and A.U.S.A. (2003), and had recurring roles on Over There and Boston Legal. Ortiz was born in New York City, and is the daughter of Angel Ortiz, a former Philadelphia City Council member of Puerto Rican descent, and an Irish-American mother, Kathleen Kulhman. As a child, Ortiz studied ballet for eight years, until the pain of dancing en pointe forced her to pursue a different artistic discipline. Ortiz graduated from University of the Arts in Philadelphia. Switching to singing, Ortiz attended the Fiorello H. LaGuardia High School of Music & Art and Performing Arts in New York City and later the University of the Arts in Philadelphia before making her professional stage debut in a regional theater production of Dangerous Liaisons. Her additional stage credits include portraying Chrissy in a European touring production of Hair, regional theater productions such as Dog Lady and the Cuban Swimmer and in the South Coast Repertory Theater's production of References to Salvador Dalí Make Me Hot. After joining LAByrinth Theatre Company, she appeared Off-Broadway in In Arabia, We'd All Be Kings, directed by Academy Award-winning actor Philip Seymour Hoffman and named one of the 10-best plays of 1999 by the magazine Time Out New York. Ortiz appeared in several television shows including NYPD Blue, Everybody Loves Raymond, Commander In Chief, ER, and The New Adventures of Old Christine. She had her first series regular role in short-lived NBC comedy series Kristin (2001). She later starred in another short-lived sitcom, called A.U.S.A. in 2003, and later had recurring roles in the FX drama Over There, and ABC series Boston Legal. In 2006, Ortiz was cast as Hilda Suarez, the lead character's sister, in the ABC comedy-drama series Ugly Betty. Originally, Ortiz had auditioned for the Betty Suarez role, saying in 2008, "I was super plain. I just put on some glasses and kept my hair kind of flat and layered on the clothing", describing what she wore when auditioning for the role of Betty. "I just wanted them to remember me, so that I could be involved in the future". In addition to her role on Ugly Betty, Ortiz was active in films, which include starring roles in Tortilla Heaven and Labor Pains. She also had a voice role in Batman: Gotham Knight, and starred in the made-for-television movie Little Girl Lost: The Delimar Vera Story in 2008. Ortiz also had a guest-starring role on Army Wives during its second season, playing a waitress named Sandi. She also appeared in the 2010 music video for Enrique Iglesias and Juan Luis Guerra's "Cuando me enamoro". After Ugly Betty ended in 2010, Ortiz was cast as lead character in the ABC drama pilot True Blue about San Francisco homicide detectives reunited to solve the murder of one of their own. The pilot was not picked up to series. The following year she appeared in the comedy film Big Mommas: Like Father, Like Son, and starred in another pilot, called Outnumbered for Fox, her second pilot not picked up to series. She later had a recurring role on the HBO comedy series Hung. Ortiz also starred in the independent films Sleeping with the Fishes, and Such Good People. In 2012, Ortiz was cast as a lead character on the ABC comedy-drama pilot Devious Maids. While ABC chose not to pick it up to series, Lifetime picked up the pilot with a thirteen-episode order. The series premiered June 23, 2013, on Lifetime with positive reviews from critics. In the show, she plays the lead role of Marisol Duarte (the alias of Professor Marisol Suarez). Also in 2013, Ortiz was special guest star in the ABC primetime soap opera, Revenge, as Bizzy Preston. In 2014, Ortiz guest-starred in episodes of two ABC shows: How to Get Away with Murder and Black-ish. In 2014 Ortiz was cast in the gay-drama film Love is All You Need? (2016), based on the 2011 short film with the same name. She did voice over work in the 2018 film Ralph Breaks the Internet. Ortiz at the Alma Awards 2012. Devious Maids was canceled after four seasons, in 2016. The following year, Ortiz starred in her third unsold pilot, a comedy called Charlie Foxtrot. Since 2019, Ortiz appears in the main cast of the comedy drama Whiskey Cavalier, playing FBI profiler Susan Sampson. Ortiz married musician Noah Lebenzon in June 2007 in Rincón, Puerto Rico. Their daughter Paloma Louise Lebenzon was born June 25, 2009. Their second child, son Rafael, was born on September 24, 2011. Ortiz is active in raising awareness against domestic abuse, citing her own experiences when she was in her 20s and involved in a romantic relationship that turned physically abusive. In an article for USA Today, Ortiz notes that the final scene from the Ugly Betty episode "How Betty Got Her Grieve Back", in which Hilda sat on her bed staring at the bathroom after realizing that Santos had died, was drawn from that experience: "I used some of that subconsciously ... It's something that is always with me". 2001 Everybody Loves Raymond Natasha Episode: "Raybert"
2000, 2002 NYPD Blue Luisa Lopez / Maria Alvarez Episodes: "A Hole in Juan" and "Dead Meat in New Deli"
2002 Strong Medicine Elena Delgado Episode: "Family History"
2002 Do Over Mrs. Rice Episode: "Rock 'n' Roll Parking Lot"
2002 ER Laura Episode: "Hindsight"
2003 Greetings from Tucson Angela Episode: "Eegee's vs. Hardee's"
2004 North Shore Ana Green Episode: "Secret Service"
2005 Blind Justice Letitia Barreras Episode: "Past Imperfect"
2005 Freddie Gina Episode: "Rich Man, Poor Girl"
2006 Commander in Chief Isabelle Rios Episode: "Wind Beneath My Wing"
2006 The New Adventures of Old Christine Belinda Episode: "Some of My Best Friends Are Portuguese"
2008 Army Wives Sandy Episode: "Loyalties"
2013 Revenge Bizzy Preston Episode: "Resurgence"
2014 How to Get Away with Murder Paula Murphy / Elena Aguilar Episode: "Smile, or Go to Jail"
2015 Black-ish Angelica Rodriguez Episode: "Black Santa/White Christmas"
2017 Angie Tribeca Betty Crocker Episode: "If You See Something, Solve Something"
^ a b c d "Ana Ortiz". TVGuide.com. Archived from the original on May 27, 2016. ^ Ryan, Maureen (November 16, 2006). "Ana Ortiz on 'Ugly Betty': 'I definitely have a Queens connection'". Chicago Tribune. Archived from the original on November 20, 2006. ^ Gray, Ellen (January 16, 2007). "'Betty's' Ortiz relishes show's hit status"". Philadelphia Daily News. Archived from the original on December 21, 2007. ^ "Win Ana Ortiz's Baby Shower Gift! (A $599 Value!)". People. April 27, 2009. Archived from the original on February 6, 2019. Retrieved February 6, 2019. ^ "Ana Ortiz: Enrique Iglesias is a Total, Juicy Hunk". Latina.com. 2010-07-29. Retrieved 2013-12-29. ^ "'Ugly Betty's' Ana Ortiz joins 'True Blue'". The Hollywood Reporter. 2010-03-03. Retrieved 2013-12-29. ^ Andreeva, Nellie. "Ana Ortiz To Star In Fox Comedy Pilot 'Outnumbered'". Deadline.com. Retrieved 2013-12-29. ^ Andreeva, Nellie. "HBO Castings: Alice Eve To Recur On 'Entourage', Ana Ortiz On 'Hung' & More". Deadline.com. Retrieved 2013-12-29. ^ "Gina Rodriguez Lands Lead Role in Indie Pic 'Sleeping With the Fishes' (Exclusive)". Hollywoodreporter.com. 2012-07-17. Retrieved 2013-12-29. ^ "Gay Comedy Such Good People Wraps Production". Indie It Press. 2013-08-19. Retrieved 2013-12-29. ^ Andreeva, Nellie. "Ana Ortiz To Lead The Cast Of Marc Cherry's ABC Pilot 'Devious Maids'". Deadline.com. Retrieved 2013-12-29. ^ Palomares, Sugey (May 16, 2012). "'Devious Maids' Never Maes It on the Air — Would It Have Hurt Latinos?". Latina. Retrieved May 17, 2012. ^ "Marc Cherry's 'Devious Maids' comes to Lifetime this summer". Entertainment Weekly. April 10, 2013. Retrieved 2013-06-10. ^ "Devious Maids - Season 1 Reviews". Metacritic. Retrieved 2013-12-29. ^ ' + data.results.personName + ' (2013-09-27). "'Revenge': 'Devious Maids' Ana Ortiz will guest-star - Zap2it". Blog.zap2it.com. Archived from the original on 2013-12-30. Retrieved 2013-12-29. ^ Michael Ausiello (2013-09-26). "'Revenge' Season 3: Ana Ortiz to Guest Star". TVLine. Retrieved 2013-12-29. ^ Vlada Gelman (August 8, 2014). "TVLine Items: Ana Ortiz Takes Stab at Murder, Helix Adds Matt Long & More". TVLine. Retrieved 9 August 2014. ^ Philiana Ng (22 October 2014). "'Black-ish': Ana Ortiz to Guest Star - Hollywood Reporter". The Hollywood Reporter. Retrieved 23 October 2014. ^ "Jeremy Sisto & More Join 'Love Is All You Need,' Kea Ho Gets 'Urge'". Deadline. 22 October 2014. Retrieved 27 October 2014. ^ "Casting Net: Meg Ryan boards 'Fan Girl,' Jacki Weaver signs on for 'Zeroville;' more". EW.com. Retrieved 27 October 2014. ^ ""Ugly Betty" Star Ana Ortiz Joins Voice Cast of Disney's "Wreck-It Ralph" Sequel (Exclusive)". Retrieved 4 March 2018. ^ Andreeva, Nellie (February 23, 2017). "Ana Ortiz To Star In 'Charlie Foxtrot' ABC Comedy Pilot". Retrieved March 4, 2018. ^ Andreeva, Nellie (February 22, 2018). "'Whiskey Cavalier': Ana Ortiz To Co-Star In ABC Pilot". Retrieved March 4, 2018. ^ "Actress Ana Ortiz married in Puerto Rico". UPI. June 11, 2007. Archived from the original on October 14, 2007. ^ Hernandez, Lee. "Exclusive: Ana Ortiz Gives Birth to a Son Named Rafael!". Latina. Archived from the original on September 26, 2011. ^ "Ana Ortiz of 'Ugly Betty' let her pain fuel Hilda's". USA Today. September 24, 2008. Retrieved October 23, 2014. ^ "13th Annual Screen Actors Guild Awards Nominations". Screen Actors Guild. 4 January 2007. Archived from the original on 4 March 2016. Retrieved 23 June 2017. ^ Bruno, Mike (2007-12-20). "The 14th Annual SAG Award Nominations". Entertainment Weekly. Archived from the original on 3 January 2008. Retrieved 2007-12-20. ^ "Nominees for 39th NAACP Image Awards Announced Live at Press Conference By Mara Brock Akil, Richard T. Jone, "Entertainment Tonight's" Kevin Frazier and NAACP Executives" (PDF). NAACP (Press release). January 8, 2008. Archived from the original (PDF) on August 7, 2008. Retrieved February 18, 2008. Wikimedia Commons has media related to Ana Ortiz.